Ok, so I must admit I’ve been a little bit lazy when it comes to the ol’ To Watch Pile, but I have been distracted. The good thing is you, dear reader, probably won’t notice as I try to run the blog six weeks ahead so there is no interruption if I need a week away or something. For the past two weeks though, I have had a couple of things I really love outside of Horror get released at my local video game specialist. 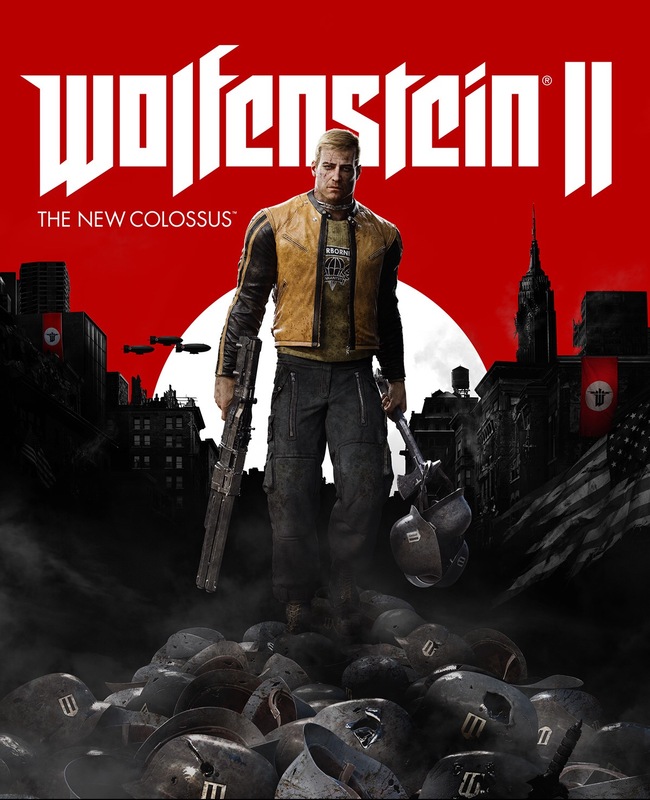 First was Wolfenstein II: The New Colossus, the first person game based in an alternate universe when the Nazis won the First World War. In itself it is a horror film, and the story with this one (so far) has been full of dread, with great graphics and amazing gameplay, and a free ‘GI Joe’ styled toy of BJ, the hero of the piece. A promotional poster for Wolfenstein II. In the same week, Mario Odyssey was released for the Nintendo Switch. I have been waiting to buy a Switch until the new Mario was released and I have grabbed 4 games to various deal of success. Odyssey is truly an amazing piece of gaming equipment! Finally, a week after those two releases, we have the big daddy release that I buy every year, Call of Duty World War II, which after three years of scifi styled stories (4 if you say Ghosts was a truly scifi setting) we are back to boots on the ground, old school weapons. Funny, after three years of complaining about the movement being far to big a factor of those games, I am finding my skill totally lacking, but it’s a good looking game… maybe I’ll get better at it. This isn’t me doing a market report or boasting of my crap gaming skills, no, this little piece is to tell you all about an amazing comic that may have slipped by without being noticed. Titan Books have a fledgling comics line that seems to be picking up steam, which thankfully doesn’t have a shared universe like Marvel or DC and is instead a series of licenses like Assassin’s Creed, the aforementioned Wolfenstein, Warhammer and The Evil Within, just to name a few. 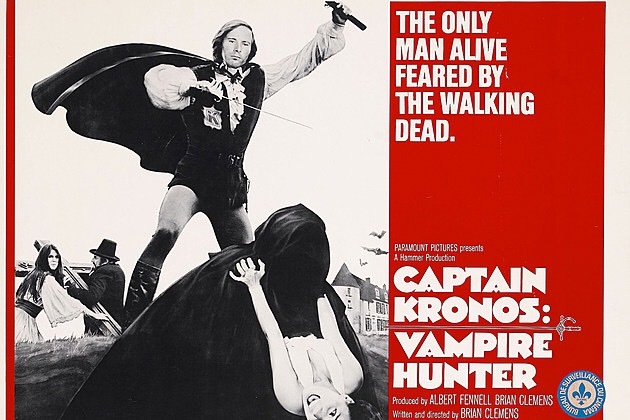 This new series I am excited about is based on a Hammer Horror film called Captain Kronos: Vampire Hunter. This series is written by Dan Abnett, probably best known for the creation of the 2000AD strip Sinister Dexter, and has worked on several Marvel titles The Punisher, War Machine and various X-men titles. I’m not the biggest fan of Sinister Dexter, but I have enjoyed his writing on other series though, including some Doctor Who Magazine comics he also wrote. The highlight for me though is the art by industry legend Tom Mandrake. I love Mandrake’s work as his art is very pre-Image comics, very proper like artists like John Buscema and Joe Kubert (probably because he was trained at Kubert’s school), and he has worked on many comics over his time, and is know for the co-creation of Batman villains Black Mask and Film Freak. Over the years he has mainly worked on DC titles, but also for Marvel, First, Eclipse and Image Comics. This comic is doing something that I detest which is alternate covers, but I do like the fact that some of the alternates are called ‘Hammer Glamour’ and have photographs of Caroline Monroe on the cover. 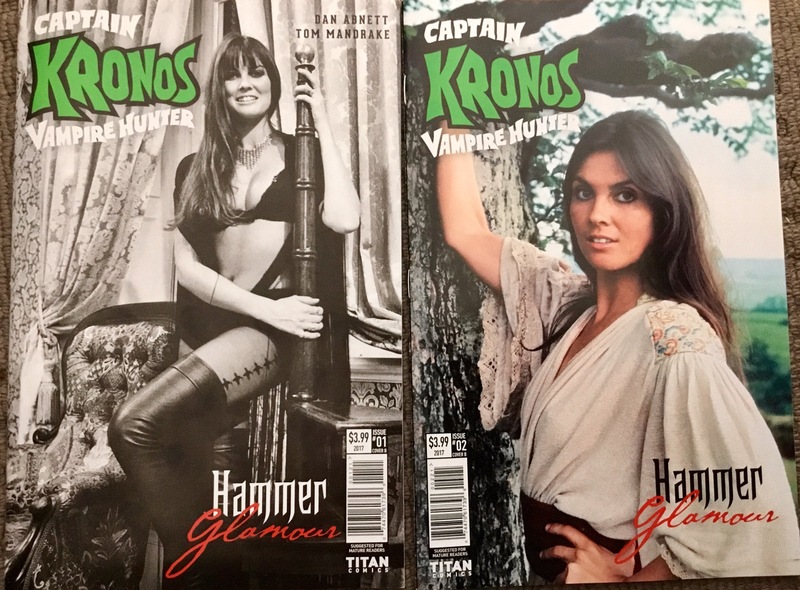 The photo covers to Captain Kronos, Vampire Hunter, issues 1 and 2. Captain Kronos: Vampire Hunter tells the tale of a group of miscreants sometime in the 18th century who hunt vampires… as the title may suggest. Captain Kronos is a handsome ex-soldier, who is fast on horse and swift with sword, Grost is his hunchbacked, one-legged assistant and finally Carla, lovely, ruthless and skilled at fighting. This comic furthers his adventures and is full of much vampires and derring-do. I certainly hope it can maintain the quality of these first two issues. If you are a fan of swashbuckling comics, vampires and old school art style, you’ll probably like this comic.